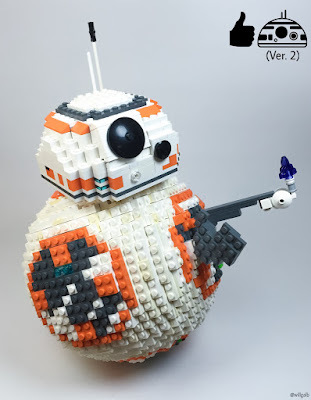 Tiles or Studs: BB-8 says "Good Job!" LEGO fan and flickr.com member willgalb shared this updated version of his BB-8 droid from the Star Wars Episode 7: The Force Awekens. This model features the iconic "Good Job!" mode as well. I especially like the mosaic version of the pattern on the large sphere. District 9 Dropship by Josiah N.
Attack of the Sea Monster! Space Cola delivered by Robots! Andrealphus, A Gundam Mech by Caleb L.
Heroes in a Half Shell, Turtle Power! "Hello Ladies..." Deadpool built with Bricks! Leisure Suit Larry Is Back in Form of Bricks! ASW-G-66 Gundam Kimaris by Caleb L.
New Compilation Page: Best Capital Space Ships! News! Summer 2016 Star Wars Sets Are Revealed! News: LEGO Star Wars Game is coming!